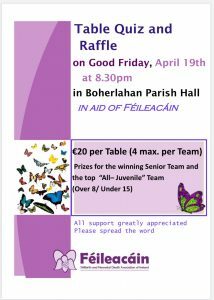 Table Quiz and Raffle in Boherlahan on Good Friday. In aid of Féileacáin – the Stillbirth and Neonatal Death Association of Ireland. 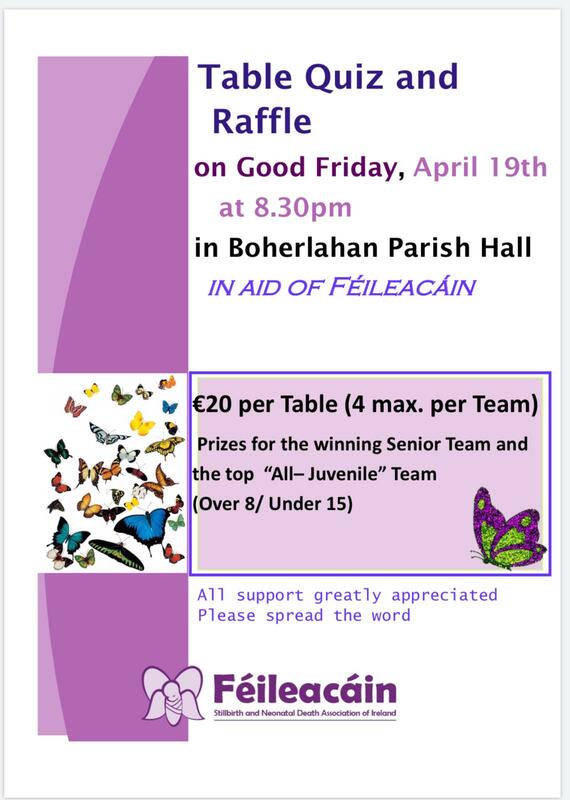 Good Friday April 19 at 8.30pm in Boherlahan Parish Hall. €20 per table, max 4 per team. Prizes for the winning senior team and top “all juvenile” team (over 8/under 15). Féileacáin was formed in 2009 and registered as a charity in 2010. Féileacáin was formed by a group of bereaved parents to offer support to anyone affected by the death of a baby around the time of birth, and the organisation is now the national charity supporting families affected by perinatal loss. Féileacáin is a volunteer-led organisation and receives no funding from central government, relying instead on the support of our community and the families who avail of our services.